Black gabardine raincoat by Foale and Tuffin. Black suede double strapped boots from Russell & Bromley. Rainbow striped sweater by Stirling Cooper. Scanned by Miss Peelpants from Vanity Fair, January 1971. Maroon jersey coat and plaid skirt by Stirling Cooper. 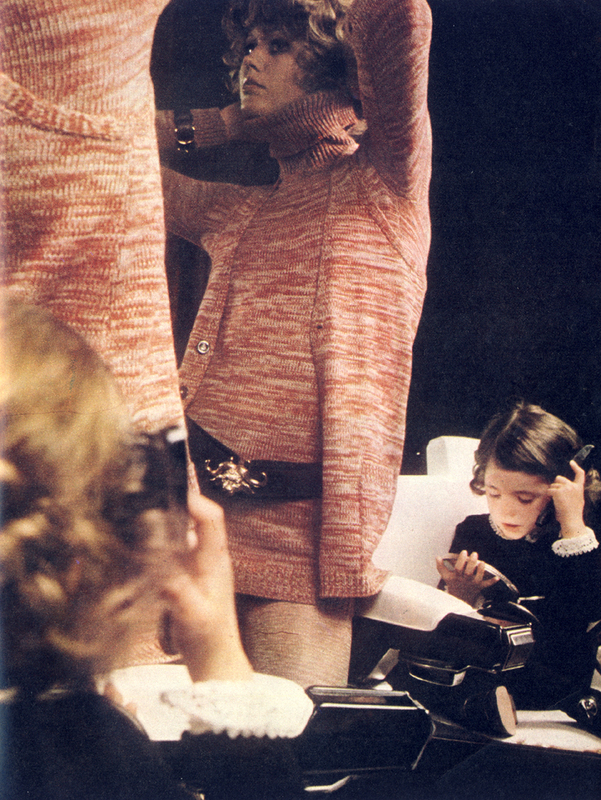 Sweater by Sonia Rykiel for Browns. Boots by Elliott’s. Brown beige and orange flecked wool gauchos worn with thick brown shetland sweater, leather studded belt and appliqued bag all from Feathers. Cap from Way In. Brown and beige tweed suit with Borg trims by Mansfield. Floppy woolly hat from Browns. Brown suede shoes by Pedro Garcia for Jack Hinton. Midi skirt and matching muffler by Maxwell Croft. Brown polo necked sweater by Sonia Rykiel from Browns. Dark brown leather boots by Chelsea Cobbler. Pale violet nightdress from Browns. A heavenly combination of slinky nightwear, mid-Seventies tech and a very welcoming looking bed arrangement. Oh, and Marie Helvin of course. This is very much how I would like to spend the next few weeks, months… in fact, a third of my life! Italian ‘Cifra’ bed by Vittorio Rossi & Luciano Bertoncini from Heal’s. 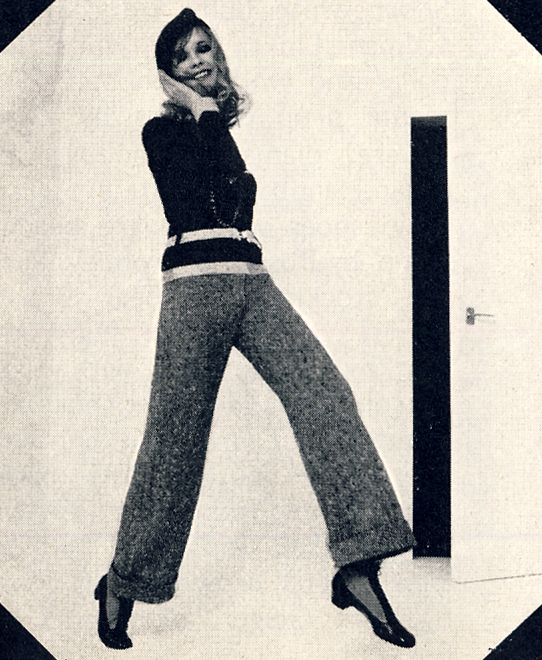 Scanned by Miss Peelpants from Vogue, July 1974. White satin de lys pujamas by Liliane Dreyfus for Vog. Pale beige crepe nightdress by Stan Herman for Charnos. White nightdress by John Kloss for Cira. Gladrags printed shirt with cotton satin knickerbockers. Plastic and raffia choker by Adrien Mann. Gladrags cotton satin shorts with bib. Just a quick glance at any of these new mid-year fabrics can lead to all sorts of sunny ideas. Will you take to squashysoft quilting or fall in love with countryside madras printed denim and shiny new satinised cotton? For the romantic there’s beautiful embroidered lawns and more than enough nostalgia in the turn-of-the-century jacquard crepes, woven on precisely the same machines as those of sixty summers past. All ready for you to wear tomorrow — or to keep aside for that long hot summer . . .
Photographed by Jean Claude Volpeliere. 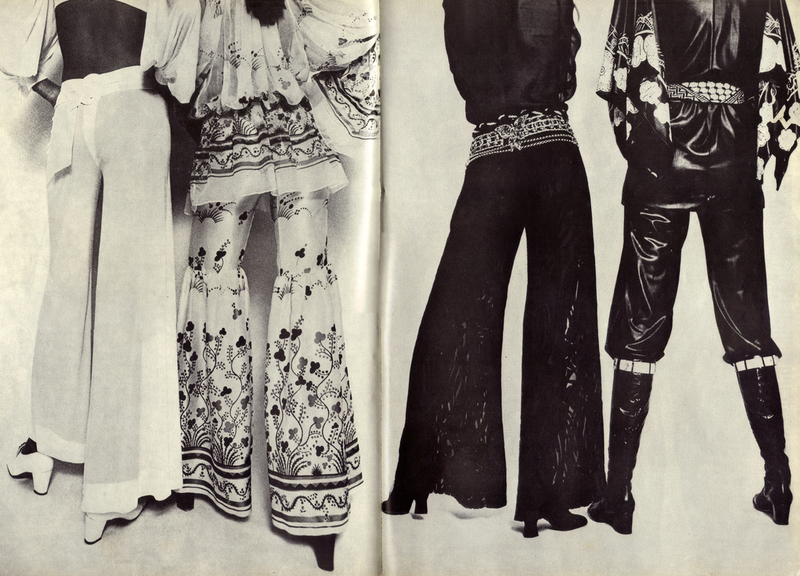 Scanned by Miss Peelpants from Petticoat, April 1971. Little bird print shirt and skirt from Biba. Suede wedge shoes from Sacha. Angora brim hat from Browns. Blue quilted shorts and shirt, both from Feathers. Blue suede shoes by Sacha. Clobber stars and stripes jacket at Stop the Shop. Bermona denim cap. Gillian Richard printed dungarees, smock and matching hat from ’27’. Gillian Richard calico smock with matching dungarees from Snob and Irvine Sellars shops. Herbert Johnson hat. .
Angela smock dress at Stop the Shop. Angela calico farmers smock worn with denim jeans, wellington boots and hat. Knitted dress from The House of Worth. Hat at Brown’s. Photographed by Sarah Moon. Styled by Cherry Twiss. Hair by Carita Salon. Skinny cardigan in boucle acrylic by Lee Bender at Bus Stop. Ring from Kutchinsky. Gold ring by Ken Lane. White ribbed catsuit by Sally Levison. Brass belt from David Elliott. Ring by Kutchinsky. 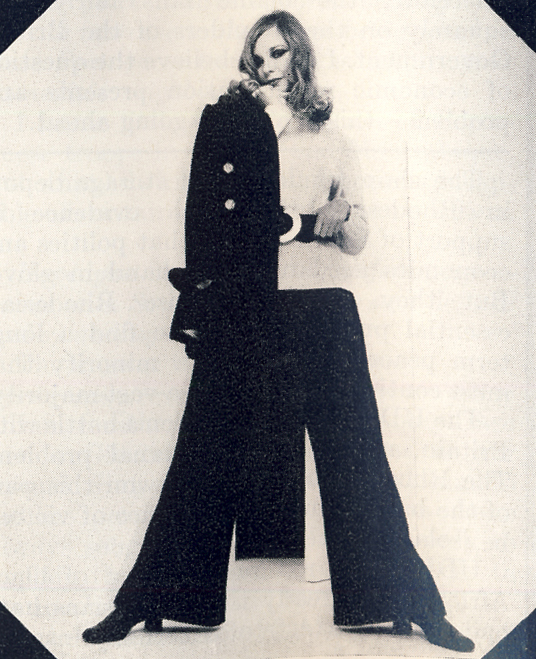 Maxi coat and trousers knitted by Women’s Home Industries. Roll neck sweater dress by Virginia. Hat by Cerruti. Marled knit polo neck sweater with sleeveless waistcoat by Biba. Leather belt by Cerruti. Square necked sideless dress by Ginger Group. Gold link belt by Paris House. Black patent shoes by Kurt Geiger. Satin beret by Rudolf. Try a touch of seasonal sorcery – swop clothes with yourself instead of with your sister or friend. Mix tweed with satin, sweaters with fur; play addition and subtraction with your wardrobe to achieve subtle solutions for every climate, every occasion and every mood. Square necked sideless dress by Ginger Group. White blouse by Eric Hart. Tortoiseshell and gilt link belt by Dior. Brown shoes by Kurt Geiger. Brown knitted beret at Fenwick. Oxford bags by Gerald McCann in Donegal tweed with detatchable black satin turn-ups. Black satin shirt by Eric Hart. Black patent belt by Mary Quant. Black patent shoes by Kurt Geiger. Oxford bags by Gerald McCann in Donegal tweed with detatchable black satin turn-ups. Brown and tweed long belted sweater from Browns. Antique Baltic amber beads from Sac Freres. Knitted brown beret at Fenwick. Beige and black ankle boots by Ravel. Short white fluffy kid coat by Calman Links, with white fox collar and white satin belt. Diamante drop earrings by Dior. Square diamante handbag by Susan Handbags. White grosgrain strap shoes by Russell and Bromley. Short white fluffy kid coat by Calman Links, with white fox collar. Round-necked chocolate sweater by Laura Jamieson, with long sleeves, buttons down back, and matching ribbed skirt. Tortoiseshell and gilt belt by Dior. Stretch brown leather boots by Kurt Geiger. Black velvet trouser suit by Carrot on Wheels. Cream silk shirt by Annacat. Square snakeskin handbag by Russell and Bromley. Black patent shoes by Kurt Geiger. Black velvet hair bow by Dior. Black velvet trouser suit by Carrot on Wheels. Beige polo necked sweater by McCaul. Black belt with perspex buckle by Dior. Leather shoes by Charles Jourdan.